Over 34,500 residents of three municipalities within the Spanish autonomous community of Madrid received a warning not to leave their homes because of the spread of a cloud of toxic smoke, El Pais reported. Toxic smoke from a sulphur plant torched by Daesh near Mosul killed two locals, injured many more and forced US troops stationed nearby to don their gas masks. The negative impact of coal-burning industries transcends internal EU borders, harming people in neighboring countries, a new report by environmental watchdogs said Tuesday. An explosion at a warehouse rocked Brazil's Port of Santos, ejecting a column of toxic smoke, local media said. On Wednesday, two massive explosions occurred in the warehouse in Tianjin, killing dozens of people. The twin blasts and a strong fire were triggered by flammable goods stored at the warehouse along with hazardous chemicals. 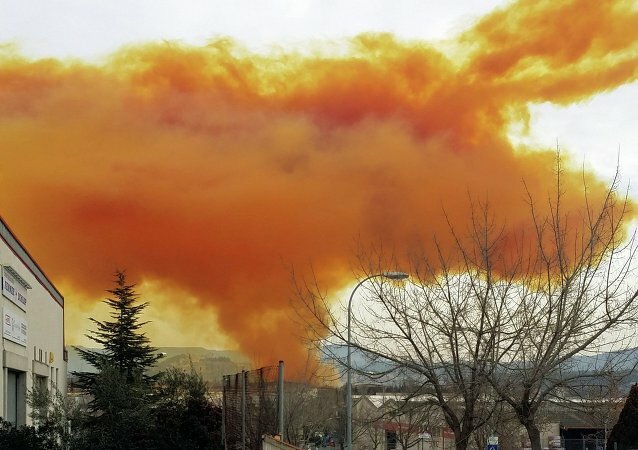 Residents of two north-eastern towns in Spain have been ordered to stay indoors after a chemical explosion at a warehouse spread a toxic cloud over the area.